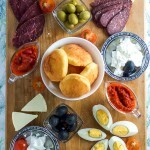 An easy way to put together an appetizer platter Balkan style. Also known as meza in the area, this type of snack platter is typical to what you may encounter on your visit to someone’s home. Meza is something you put together quickly. It’s a platter of goodies for guests to munch on while you take your time finishing up the dinner. There is no specific way to make these. You see what’s in your fridge, and let your creativity take over. 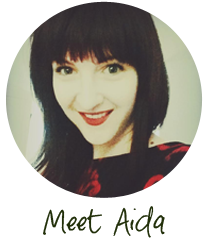 But to give you an idea about typical things you may encounter on a Balkan meza platter, the one I put together for you here is similar to what you may see. The foundation of a good meza platter are good cheeses and meats. In terms of meats we’re talking about sausage and smoked beef. The sausage is generally beef, and quite mild. However, if you prefer your sausage spicy, then use the spicy kind. There is no right or wrong way to put a meza platter together. A wide range of cheeses are used for meza. Mild, soft ones include goat and young cow cheeses. For harder cheeses there is the famous travnički sir, which is a type of local feta. Finally, there is kajmak, a beloved, local dairy product similar to clotted cheese. If you can’t find it, use cottage cheese. It’s not the same, but it’ll do. Some store cheese rounds are fine too. 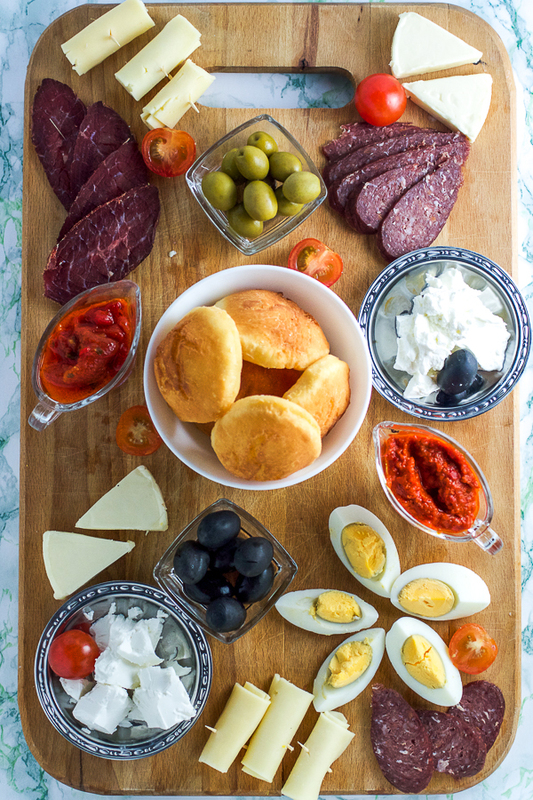 A quality meza platter will include some homemade ajvar (red pepper spread) and/ or pindjur (red pepper and tomato spread), and maybe some boiled eggs. Vegetables range from turšija (fermented veggies), to olives and tomatoes. I found one detail that transforms an average meza platter into a fantastic one. This detail is the homemade bread, or fried mini breads. People adore this touch, especially if you’ve just made it, or warmed it up before serving. If you’re on the run, use crackers. The point of meza is to start you off thinking about dinner. It’s not to exchange the dinner. Therefore, meza portions are on the smaller side. Just a little something to whet your appetite. What I am giving you here is just an idea. You’re welcome to explore it and make it your own. When you do, report back. I’d love to hear what’s on your appetizer platter. Place all ingredients on a platter, a large plate, or a cutting board. Arrange anyway you’d like. If you’re going for a traditional Balkan meza platter, try to find as many of these ingredients as you can. As you may not be able to find some of them, I gave suggestions as to what you can exchange them with. Keep in mind if you do a lot of exchanges, yours will be more of a Balkan-inspired and less of a Balkan traditional platter, but it’ll still taste delicious.